In 1879 St. Bernadette wrote a letter to Pope Leo XIII in which she warns that a new, big war could break out at the turn of the Millennium. “On the eve of the year 2000 a final clash between the followers of Mohammed and the Christian nations will happen. In a horrible battle, 5,650,451 (more than five millions , the Armageddon? ) soldiers will loose their life and a bomb with great impact will be thrown onto a city in Persia.” “At the end, the sign of the Cross will conquer and all Muslims will embrace the Christian Faith. Great wealth will follow and the Lord will pour out His blessings over the faithful.” Poverty, disease and hunger have an end, every tenth person will have the power to heal. 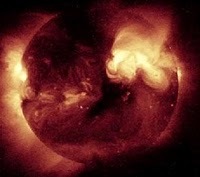 “The 21st Century will be known as the Second Golden Age of mankind”, the seer concluded. 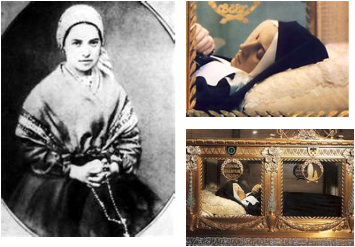 For reasons known to God alone, these events spoken of by St. Bernadette, have been postphoned a decade or so but with revolutions and wars breaking out all over the middle East and Africa, we can see these predictions unfolding everyday. In 1973, Our Lady gave Sister Agnes Katsuko Sasagawa in Akita, Japan three messages that have been approved by the local bishop. The wooden statue of Our Lady of Sorrows and of All Nations cried blood 101 times. 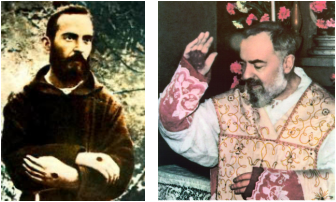 "Fire Will Fall From the Sky"
"The work of the devil will infiltrate even into the Church"
1949: Our Lord to Padre Pio: "My son, My son, I have been longing for this hour in which I again shall reveal to you the great love of My heart... Pray and make reparation to Me. Admonish others to do the same because the time is near at hand in which I shall visit My unfaithful people because they have not heeded the time of My grace. Persevere in prayer, so that your adversary shall have no dominion over you. Tell My people to be prepared at all times, for My judgment shall come upon them suddenly and when least expected -- and not one shall escape My hands, I shall find them all! I shall protect the just. Watch the sun and moon and the stars of the Heavens. When they appear to be unduly disturbed and restless, know that the day is not far away. Stay united in prayer and watching until the angel of destruction has passed your doors. Pray that these days will be shortened." 1/23/50: Our Lord to Padre Pio: "Pray! Make reparation! Be fervent and practice mortifications. Great things are at stake! Pray! Men are running toward the abyss of Hell in great numbers, rejoicing and merry-making, as though they were going to a masquerade ball or the wedding feast of the devil himself! Assist Me in the salvation of souls. The measure of sin is filled! The day of revenge, with its terrifying happenings is near -- nearer then you can imagine! And the world is sleeping in false security! The Divine Judgment shall strike them like a thunderbolt! These Godless and wicked people shall be destroyed without mercy, as were the inhabitants of Sodom and Gomorra of old. Yes, I tell you their wickedness was not as great as that of our human race today!"